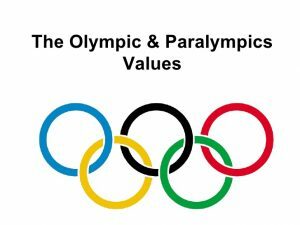 There are many ways to look at the values of the Paralympics. There is the value that is placed on this event by the fans who avidly wait for each Paralympic event to unfold. Then there are the Paralympic values that have been set by the organization itself. In general, most understand how important the Paralympics are to the participants but taking a closer look at what it really means to them brings an even deeper meaning to this particular sporting event. No one that has ever had the privilege of watching a Paralympic event will question the determination that each one of the participants possess. It is well noted that every athlete in the Paralympics push themselves to their limit both in their physical and emotional abilities. It not only takes a great deal of courage to take part in the Paralympics, it takes courage to put themselves on display in front of massive crowds of onlookers who have set great expectations for them. It takes courage for those with disabilities to overcome their situation and can take the courageous steps necessary to become a Paralympic participant. Inspiration is something that is in the air at the games, no matter the sport. There is no doubt that no matter what place each athlete ends up in their chosen sport they serve as an inspiration for thousands upon thousands of others who are also afflicted with disabilities that get the opportunity to watch these athletes perform. This is another value that the Paralympics holds in that participants feel that they have the right and the ability to participate in their chosen sport like anyone else has. It is a great way to highlight that disability does not equate to inability.